Mallinson Rendel Publishers is pleased to be releasing an expanded, hardback edition of the very popular Big Weather : Poems of Wellington, first published as a paperback in 2000. The new edition is a beautiful hardback book that has been lovingly revised and expanded by Gregory ... read full description below. 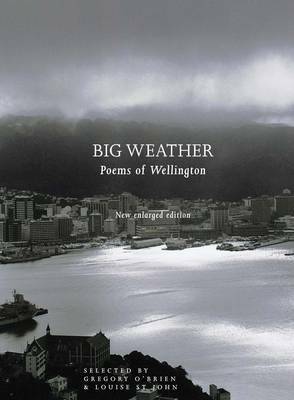 Mallinson Rendel Publishers is pleased to be releasing an expanded, hardback edition of the very popular Big Weather : Poems of Wellington, first published as a paperback in 2000. The new edition is a beautiful hardback book that has been lovingly revised and expanded by Gregory O'Brien and Louise St John. Since the nineteenth century, Wellington has been the site and object of much literary activity and never more so than now. Where many of New Zealand's leading poets once wandered, frequenting bars, delivering mail up the steepest of streets, raising their children in the suburbs, today's XY generation are now vividly, energetically present, and recent poetry has kept track of the changing inner and outer life of the city. As well as New Zealand's major writers, visitors from near and far have responded to the city - poets as various as Australian Henry Lawson and Americans Robert Creeley and Michael Palmer. Big Weather: Poems of Wellington captures the vivacity and diversity of the capital, beginning with the inner city and harbour, moving into the suburbs and parks, heading out to Lower Hutt, Porirua and as far north as Paraparaumu before - in this new edition - turning again to the heart of the city, this time in the twenty-first century. These poems provide a composite portrait of Wellington and a celebration of its bustling creative life.